1. Place new head to block gasket on cylinder block. 2. 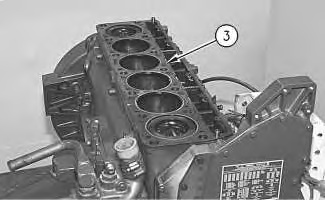 With cylinder head rotated to the proper position (to ensure proper porting); place the cylinder head onto the cylinder block. 3. 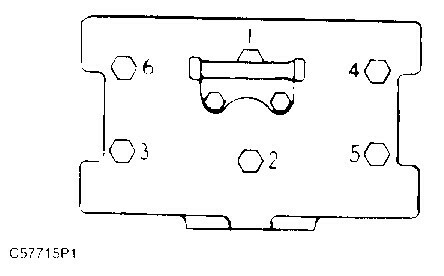 If the governor bracket was mounted on the cylinder head before disassembly, replace the governor bracket to its proper position at this time. 4. Assemble the six bolts. Tighten the two center bolts to a torque of 14 to 18 N·m (125 to 160 lb in), then the four end bolts. Increase the bolt torque to 21 to 28 N·m (185 to 245 lb in). Torque the two center bolts first and then the four end bolts.